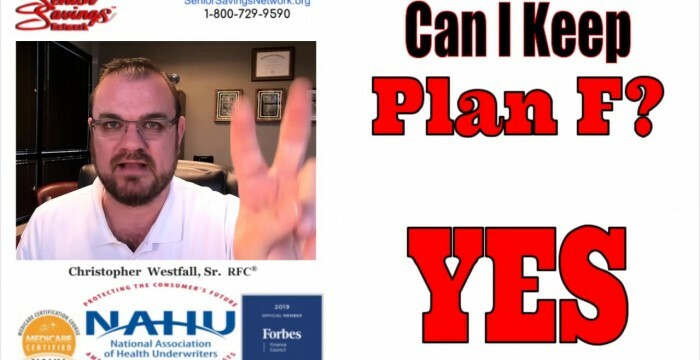 Can I Keep Plan F | Is Plan F Going Away? Yes, you can keep Plan F, but when you see what's coming, you might not want to. Plan F cannot be sold by those new to Medicare after January 1, 2020 due to the MACRA law. Make sure to also click on the BELL icon when you subscribe! Our service is 100% Free and we have the same rates the carriers have, directly, so you get us for free! This entry was posted in medicare supplement and tagged Benefits of Plan N, best medicare agent, best medicare plan, boomer benefits, Can I Keep Plan F, chris westfall, christopher westfall, Is Plan F going away, january 1 2020 medicare, Keith Armbrecht, MACRA, medicare, medicare health plans 2019, medicare plans 2019, Medicare Supplement, Medicare Supplement Plan F, medicare.gov, plan f coverage, plan f medicare, plan f rate increases, plan f vs plan g, plan f vs plan g youtube, plan n, senior savings network, What is Plan N. Bookmark the permalink. ← Plan N Medicare Supplement – Is it really a good value? Chris, your cruise ship analogy was a great way to explain what is going to happen to people on Plan F. I pity the last few passengers on that cruise. Thanks for watching and commenting, Red Oscar! What other topics would be helpful to have in-depth videos on? Please leave your suggestions here in the comments. Thank you!